To do the script, first I drew tiny panel thumbnails in one of my notebooks—drew and redrew them with stick figures, inserting empty dialog balloons and caption boxes inside the panels and jotting possible dialog and captions outside of them. Scripting comics is fiendishly demanding—it’s more an art of subtraction than addition. After I felt my breakdowns told a coherent story, I wrote an actual script. I liked it, but was afraid, almost positive, it was too wordy. Even so, I thought I’d send it off to James and see what he thought. My first draft follows directly below. Beneath it, you’ll find James Sturm’s response to me about it, sent a day or two later. Caption 1: During World War I, glow-in-the-dark wristwatches were provided to American troops fighting in Europe—easier to synchronize attacks when soldiers weren’t fumbling around for pocket watches. Caption 2: The watch dials—and eventually alarm clock dials, compass dials, and door numbers—were painted with radium-laced paint by teenage girls. Such finicky work was most profitably handled by a labor force with small, steady hands and keen eyesight. Caption 3: Radium, of course, was perfectly safe. In 1917. Dialog off (Agnes): Your guy still coming home for Christmas? Description: The dial painting studio. Tall multi-pane window. We should see at least one long table/workbench with four teenage girls (16-20) sitting along one side of it on high stools. Two of the girls, seated on side-by-side stools, have turned to one another; they’re talking. The dark haired pretty girl is ROSE. The mousy blonde is AGNES. Another girl is bent over a dial blank, working; the last girl in the row is touching the point of her brush to the tip of her tongue to make a fine point. The DEPT. SUPERVISOR, a stocky woman in a white lab coat, stands alongside the last girl, instructing her. A subtle twinkling glow emanates from everything, objects and people alike. Rose: Yes—and I’m pretty sure there’s something he wants to ask me. Supervisor (to the girl with the brush tip in her mouth): You’ll always get a nice firm point if you just…roll it…across your tongue. Very good! Excellent! Supervisor: Rose! Mind on your work, my girl! Description: Outdoors, overhead shot. An L-shaped early-20th-century 2-story brick factory building; tall many-paned windows. If it can be fitted naturally: on the roof, either completely or in partial, is a tall, braced illuminated sign: “Lux Radium Company.” Night. A moon overhead. Early winter scene. It’s dark, and the dial painters are all leaving work together, in clumps and in pairs, etc., exiting from a couple of doors; they’re tiny from our vantage and they’re all glowing brightly in the pitch black. Cumulatively, they light up the courtyard in front of them. This should look very odd, be unsettling, but magical too. To give the image contrast, some non-dial-painting male workers might be seen crossing the courtyard as well, completely in silhouette. The dialog pointers can point anywhere, really, into the crowd of girls; if there are two girls walking distinctly together, the pointers could go to them. Girl in the crowd/Agnes: Do you think he’ll want to get married before he ships off to France? Other Girl in the crowd/Rose: Anything’s possible, Agnes—but one step at a time! Girl in the crowd/Agnes: Oh Rosie, I’m so excited for you! Description: Rose, in her lower-middle-class bedroom at home. She’s dressed in a 1917-appropriate slip, and she’s sitting or standing at a large dresser or table mirror, applying makeup, except that she’s using a dial-painting brush and she’s drawing a line with it across the top of one eyelid. And she’s not using make-up, she’s using radium paint (there’s saucer of paint that she sneaked out of work on the dresser/table); already she’s done her lips and they’re glowing brightly. Also, her fingernails. Her hair, too, is gently sparkling/sparking. Caption: Rose Gray, 18, wanted to look especially…alluring for her soldier-beau at the Christmas Ball, so she sneaked a little dial paint home from the factory and added it to her cosmetics. Well, this was an extra-special occasion! Besides, the company wouldn’t miss a teensy bit of phosphorescent paint—they had vats of it! Dialog off (Rose’s Mother): Rose! Honey, Andy’s been waiting patiently for half an hour! Description: In the narrow hallway of a small urban row house, looking up the shabby-ish stairs to Rose who is assuming a glamorous pose at the top. At the foot of the stairs, in the foreground, are ROSE’S MOTHER and ANDY. Andy is wearing a U.S. Army private’s/infantryman’s uniform, circa 1917. Maybe there’s a framed cheap sentimental picture on the wall along the staircase. But while the premises are poor-genteel, the image is Gone With the Wind dramatic: Andy and Rose’s Mother look amazed and delighted gazing open-mouthed up at Grace wearing a nice, but nothing spectacular, winter-party dress. What makes Rose look remarkable is that’s she’s beaming light like some medieval saint or glamorously backlit movie star. Caption: And that night Rose Gray looked most alluring. She looked—radiant! Description: A Christmas ball, circa 1915-20; not country-club swank, more a community center type of affair. Young working-class men and women on a dance floor, seasonal decorations on the walls, perhaps a bandstand (with orchestra) indicated. The couples are surrounding Rose and Andy, giving them a wide berth. The lights have been turned off for the last dance, but Rose is glowing in Andy’s arms (they’re dancing), and the men and women standing around them are all applauding, some illuminated by Rose’s light, others in silhouette. Rose looks happy, Andy is in awe of his uncanny girlfriend. Caption 2: When the lights were turned off for the last dance, there was a collective gasp—then ecstatic applause for Rose Gray the Radium Girl! Caption 3: Yes, Andy proposed. And Rose accepted. Caption 1: Andy had a short war (concussion, recovery, honorable discharge) and married Rose the following summer. She quit her job at the radium company and they moved to another city. Description: Rose’s married bedroom. She’s sitting propped up against several pillows in the iron bedstead. Beside the bed is a night table with a small lamp and a large collection of pill bottles, a water glass, a spoon. Rose’s friend from the radium company, Agnes, is sitting on a straight-back chair at bedside. The two women are engaged in an intense conversation; both of them have aged dramatically and both look haggard and ill; Agnes’ cane is on the floor alongside of her chair, or else it’s hooked over the chair back. Rose is in her nightgown and on one side of her face, her jawline is thickly bandaged. Her hair is ratty, turning gray. Both women emanate a few weak radiation lines from their heads or bodies. The dresser or highboy where the wedding photo is displayed is fully or partly visible. Maybe a window with drapes or curtains. If the drapes or curtains are open, it’s daytime. Off in a corner somewhere, just tossed there, is a child’s rag doll and a ball. Just a reminder and we’ll come back to this later in the script, that Rose has become a mother. Caption 2: In 1925, when Rose was 25 (and looked 60), she had a visit from Agnes. They hadn’t been in touch for several years. Rose 1: It’s so kind of you to visit your sick friend—especially when you seem so unwell yourself! Agnes: Unwell! I’ve been poisoned—same as you! Same as twenty other girls that we worked with, Rosie. That radium dust we breathed is stuck to our bones! It’s killing us! Rose 2: But they said it was safe! Description: The radium company’s suave and unruffled chief legal officer, SLAUGHTER “SLY” AMBOY, ESQ., is addressing assorted members of the press from an unmiked (this would be too early for that) podium. The reporters are all male, are all jotting on note pads, are all wearing hats; a “PRESS” card is tucked into a few hatbands. The “Lux Radium Company” logo hangs on the front of the podium. Caption 2: The Lux Radium Company. Owned by assorted fat cats, but represented by their public face and chief legal counsel, Slaughter “Sly” Amboy, Esq. Sly 1: And we still say that radium is safe. A boon to mankind! Today it lights up our watches, tomorrow it may cure every disease known to mankind! Sly 2: Those women? I feel sorry for them and their wretched lives—but most doctors, I think, would put the blame for their travails squarely on syphilis and not, gentlemen, on phosphorescent paint! Sly 3: Their lawsuit is groundless. Description: A “strategy session” in Rose and Andy’s kitchen, a modest place; lower-middle class. Maybe a four burner cast iron stove, a sink and a dry sink, pantry shelves with flour, sugar, cans of soup. Around the kitchen table sit Rose, Andy, and the Radium Girls’ “Eccentric Lawyer,” a Real Albert Finney/Paul Newman Flawed-Man Type named TERRY DWYER. He has legal documents, some flat, some tubed, scattered in front of him. Also in front of him, but to one side, is a highball glass, half filled. He’s gesturing as if making a point. Rose looks sicker, smaller, shrunken; she’s in a wooden wheelchair parked at the table. But her face is set and determined. Weak squiggles of radiation come off her body here and there. Andy is sitting across from Dwyer with two dress-wearing small daughters—2 and 4, 3 and 5, whatever—planted on his lap. Note: For the panel’s composition, the dialog reads: Dwyer, Andy, Rose. Caption 1: “Their lawsuit”? Rose’s idea! Rising in anger from her sickbed, she’d rallied her dying former co-workers and together they’d recruited the best lawyer they could find. But not the best lawyer there was. Caption 2: Terry Dwyer. Charismatic/irascible/demon-plagued. Terry Dwyer: “Sly” Amboy is good in court—and he’s twenty times smarter than I am. But how’s he gonna say his company didn’t know radium was deadly when all their lab guys wore gloves and masks and used tongs! Andy: You know they’ll just drag this out till Rose and the other girls are all—until we’re all bankrupt! Think of our daughters, Rose! Rose: I’ve got to see this through. If not to the end, then—at least for as long as I’ve got left. Description: A packed courtroom. The Judge on his high bench is peering over to see Rose, sitting up in a hospital bed (placed on the floor in front of the jury box). With a long-handled paintbrush and the tip of her tongue she is demonstrating for the jurors (possibly in the panel, but not necessary; if they are shown, they’re all male) how she and the other girls used to get a very fine point back in the dial-painting factory. A very few radiation squiggles come off her body now. Hardly any. She looks very sick and weak. Caption 1: The Radium Girls finally had their day in court! Sick and weak, Rose was carried into on a stretcher and testified from a hospital bed. Terry Dwyer: Day in and day out, gentleman of the jury, these poor girls were told to put poison in their mouths–as part of the job! And the company knew it was poison! But what did they care—there were profits to be made! Caption 2: Terry Dwyer became a better man. But more cynical. Less drinking, fewer demons. Caption 3: Slaughter “Sly” Amboy became state Attorney General. Then Governor. Then Senator. Caption 4: None of the Radium Girls lived beyond the age of 30. Their graves will be radioactive for the next 500 years. Description: A callback of Panel Six: young Rose and Andy dancing at the Christmas Ball, Rose ecstatic as she glows radiantly in the darkened ballroom. This should be a larger image of them than the one back in Panel Six, with only a suggestion of the applauding onlookers. The dialog/caption sequence should bring the reader’s eye down logically to the Inset in the lower right-hand corner of the panel. Note: The dialog sequence can be encapsulated in balloons without pointers or in ruled rectangles/boxes, but either way, each exchange of the dialog should be put in quotation marks. The dialog for the inset image of the Cigar-Chomping Comic-Strip-Movie-Mogul should be in a balloon with a pointer, and have no quotation marks. Inset: Inside the oval is the quintessential Cigar-Chomping Comic-Strip-Movie-Mogul; he’s cranky and barking somebody’s head off, as usual. Movie Mogul: You had me right up through when she put on that radioactive makeup. I thought she was gonna get superpowers. Ever think of doing that? Or, like, her touch becomes deadly? Or her kiss! Her kiss kills! Caption: During World War I, glow-in-the-dark wristwatches were provided to American troops fighting in Europe. The dials were painted with radium-laced paint by teenage girls. The work was perfectly safe. Or at least that’s what they thought in 1917. Caption: The girls were instructed to get a nice firm point on the paintbrush by rolling it across their tongues. The dial painting studio. Tall multi-pane window. There is a long table/workbench with four teenage girls (16-20) sitting along one side of it on high stools. Two of the girls, seated on side-by-side stools, have turned to one another; they’re talking. The dark haired pretty girl is ROSE. The mousy blonde is AGNES. To the right of them, another girl is bent over a dial, working; the last girl in the row is touching the point of her brush to the tip of her tongue to make a fine point. The DEPT. SUPERVISOR, a stocky woman in a white lab coat, stands alongside the last girl, instructing her, but looking over to Rose. A subtle twinkling glow emanates from everything, objects and people alike. Outdoors, overhead shot. An L-shaped early-20th-century 2-story brick factory building; tall many-paned windows. If it can be fitted naturally: on the roof, either completely or in partial, is a tall, braced illuminated sign: “Lux Radium Company.” Night. A moon overhead. Early winter scene. It’s dark, and the dial painters are all leaving work together, in clumps and in pairs, etc., exiting from a couple of doors; they’re tiny from our vantage and they’re all glowing brightly in the pitch black. Cumulatively, they light up the courtyard in front of them. This should look very odd, be unsettling, but magical too. To give the image contrast, some non-dial-painting male workers might be seen crossing the courtyard as well, completely in silhouette. Caption: Rose Gray, 18, wanted to look especially…alluring for her beau at the Christmas Ball, so she sneaked a little dial paint home and added it to her cosmetics. This was an extra-special occasion and the factory had plenty to spare! Rose, in her lower-middle-class bedroom at home. She’s dressed in a 1917-appropriate slip, and she’s sitting or standing at a large dresser or table mirror, applying makeup, except that she’s using a dial-painting brush and she’s drawing a line with it across the top of one eyelid. And she’s not using make-up, she’s using radium paint (there’s saucer of paint that she sneaked out of work on the dresser/table); already she’s done her lips and they’re glowing brightly. Also, her fingernails. Her hair, too, is gently sparkling/sparking. Dialog off (Rose’s Mother): Rose! Honey, Andy’s waiting! In the narrow hallway of a small urban row house, looking up the shabby-ish stairs to Rose who is assuming a glamorous pose at the top. At the foot of the stairs, in the foreground, are ROSE’S MOTHER and ANDY. Andy is wearing a U.S. Army private’s/infantryman’s uniform, circa 1917. Maybe there’s a framed cheap sentimental picture on the wall along the staircase. But while the premises are poor-genteel, the image is Gone With the Wind dramatic: Andy and Rose’s Mother look amazed and delighted gazing open-mouthed up at Grace wearing a nice, but nothing spectacular, winter-party dress. What makes Rose look remarkable is that’s she’s beaming light like some medieval saint or glamorously backlit movie star. Exclamation points over ANDY and MOTHER’s heads. Caption: When the lights were turned off for the last dance, there was a collective gasp—then ecstatic applause for Rose Gray the Radium Girl! That night, Andy proposed. And Rose accepted. A Christmas ball, circa 1915-20; not country-club swank, more a community center type of affair. Young working-class men and women on a dance floor, seasonal decorations on the walls, perhaps a bandstand (with orchestra) indicated. The couples are surrounding Rose and Andy, giving them a wide berth. The lights have been turned off for the last dance, but Rose is glowing in Andy’s arms (they’re dancing), and the men and women standing around them are all applauding, some illuminated by Rose’s light, others in silhouette. Rose looks happy, Andy is in awe of his uncanny girlfriend. Caption: Andy married Rose the following summer. She quit her job at the radium company, moved to another city, and started a family. Rose and Andy going to church with a little girl. Another kid in the strollerRose is pushing. Rose’s married bedroom. She’s sitting propped up against several pillows in the iron bedstead. Beside the bed is a night table with a small lamp and a large collection of pill bottles, a water glass, a spoon. Rose’s friend from the radium company, Agnes, is sitting on a straight-back chair at bedside. The two women are engaged in an intense conversation; both of them have aged dramatically and both look haggard and ill; Agnes’ cane is on the floor alongside of her chair, or else it’s hooked over the chair back. Rose is in her nightgown and on one side of her face, her jawline is thickly bandaged. Her hair is ratty, turning gray. Both women emanate a few weak radiation lines from their heads or bodies. Maybe a window with drapes or curtains. If the drapes or curtains are open, it’s daytime. Rose: Agnes, it’s so kind of you to visit your sick friend, after all this years! Agnes: Sick! You’ve been poisoned, Rosie—same as me! Same as twenty other girls that we worked with. That radium dust we breathed is stuck to our bones! It’s killing us! Caption: The lawsuit was Rose’s idea! Rising in anger from their sickbeds, she and her former co-workers had recruited the best lawyer they could find: Terry Dwyer. A “strategy session” in Rose and Andy’s kitchen, a modest place; lower-middle class. Maybe a four burner cast iron stove, a sink and a dry sink, pantry shelves with flour, sugar, cans of soup. At the left of the panel, the Radium Girls’ “Eccentric Lawyer,” TERRY DWYER, a Real Albert Finney/Paul Newman Flawed-Man Type, sits at the kitchen table. He has legal documents, some flat, some tubed, scattered in front of him. Also in front of him, but to one side, is a highball glass, half filled. He’s gesturing as if making a point. Andy is sitting in the center of the panel with two dress-wearing small daughters—2 and 4, 3 and 5, whatever—planted on his lap. Rose, at the right, looks sicker, smaller, shrunken; she’s in a wooden wheelchair parked at the table. But her face is set and determined. Weak squiggles of radiation come off her body here and there. Caption: The Lux Radium Company was owned by assorted fat cats, but was represented by a single public face: chief legal counsel, Slaughter “Sly” Amboy, Esq. The radium company’s suave and unruffled chief legal officer, SLAUGHTER “SLY” AMBOY, ESQ., is addressing assorted members of the press from an unmiked (this would be too early for that) podium. The reporters are all male, are all jotting on note pads, are all wearing hats; a “PRESS” card is tucked into a few hatbands. The “Lux Radium Company” logo hangs on the front of the podium. Sly 1: Radium is a boon to mankind! Today it lights up our watches, tomorrow it will cure every disease known to mankind! Sly 2: These woman suffer from syphilis, gentlemen, not phosphorescent paint! Their lawsuit is groundless. Caption 1: The Radium Girls finally had her day in court! A packed courtroom. The Judge on his high bench is peering over to see Rose, sitting up in a hospital bed (placed on the floor in front of the jury box). With a long-handled paintbrush and the tip of her tongue she is demonstrating for the jurors (possibly in the panel, but not necessary; if they are shown, they’re all male) how she and the other girls used to get a very fine point back in the dial-painting factory. A very few radiation squiggles come off her body now. Hardly any. She looks very sick and weak. Terry Dwyer is standing beside Rose’s bed, having asked the question that prompted her demonstration. He’s gesturing lavishly, making a major point. If there’s room, Sly Amboy (at the defendant’s table) or loyal husband Andy (in the first row of the courtroom) could be drawn in the background. Terry Dwyer: Day in and day out, gentleman of the jury, these poor girls were told to put poison in their mouths–as part of the job! The company knew it was poison! But what did they care—there were profits to be made! Caption 1: The verdict was disappointing. The company had to pay a portion of the Radium Girls’ medical bills…for a period of two years…but it was not found to be legally at fault. 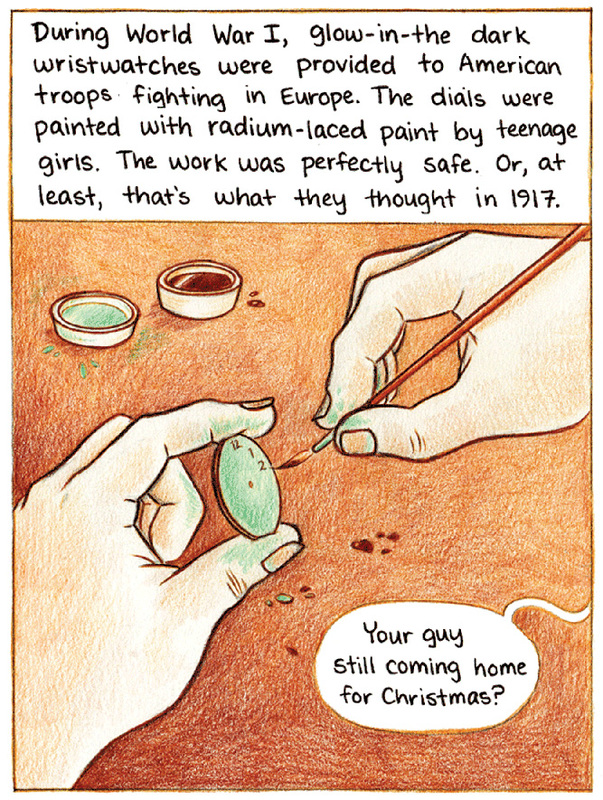 None of the Radium Girls lived beyond the age of 30. Though their graves will be radioactive for the next 500 years, through their sacrafice radium was finally recognized for the dangerous thing it is. This entry was posted in COMICS WRITINGS and tagged 12 Panel Pitch, Center for Cartoon Studies, James Sturm, King Touey, Melanie Gillman, Radiant, Radium Girls by Tom De Haven. Bookmark the permalink.